FRAG organise monthly talks by invited speakers about art and craft and annual trips to visit other regional art collections. Robert McMillan, who acts as a tour guide for the Grade 1 listed, Victorian Gothic Town Hall, will give us a flavour of the art, architecture and history of this magnificent building. Oil Paintings Conservator and Restorer, Julia Dalzell, will talk about some of the fascinating projects she has worked on for museums, galleries and historic houses. The talk will take place against the backdrop of the exhibition ‘Harry Meadley: But what if we tried?’ which will include a number of works within the borough’s fine art collection that have undergone conservation or are in need of it. We will visit Cannon Hall Museum, Barnsley, which has collections of fine and decorative arts, set within its house, park and gardens. 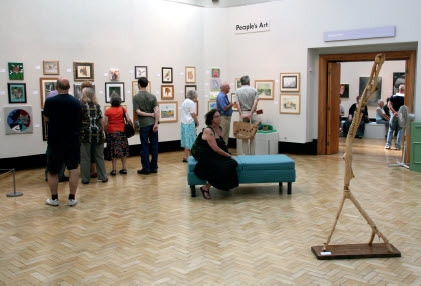 The Friends of Rochdale Art Gallery have been essential to our continued growth and development as an important regional art gallery. Through their generous donations over the years we have been able to conserve and acquire countless key works of art for the collection including Interior (The Open Window) by artist Vanessa Bell and purchased in 1982. Annual membership is only £10 and in addition to knowing you are supporting your local art gallery, you also get discounted rates on the annual programme of talks and trips organised by the Friends and invitations to private views for all exhibitions. You can either post a cheque for £10 (made payable to FRAG) to c/o Touchstones Rochdale, The Esplanade, Rochdale OL16 1AQ (please make sure you include a cover letter clearly stating your full name, address, postcode, telephone number and email address), ring 01706 924928 and pay over the phone, or come along to one of the talks organised by the Friends and pay in person. Vanessa Bell, Interior (The Open Window). © 1961 estate of Vanessa Bell. Courtesy Henrietta Garnett. Photo: Rochdale Arts & Heritage Service.